I. used potatoes that were about 2″ in diameter. Peel potatoes, cut very end off. Slice the same width as the bacon. Place in a mixing bowl and drizzle with enough olive oil to completely coat potatoes. In a small bowl add dry ingredients. Give a little taste and adjust seasonings to your taste. Mix together well. Pour into bowl with oiled potatoes and toss. Using your hands be sure potatoes are well seasoned. 2. Use 1/2 slice of bacon for each potato. Wrap around the potato and secure with a toothpick. 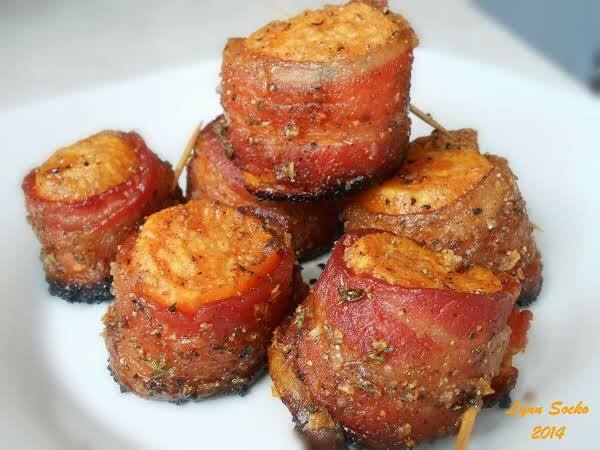 Once all are wrapped, roll the bacon in the leftover rub to coat. 3. Place on a non stick surfaced pan, these will caramelize on the bottom and tend to stick. Bake at 350 for 35-45 min. until potatoes are tender and bacon is browned. Remove immediately. Sprinkle coarse sea salt on them as soon as you remove them from pan.